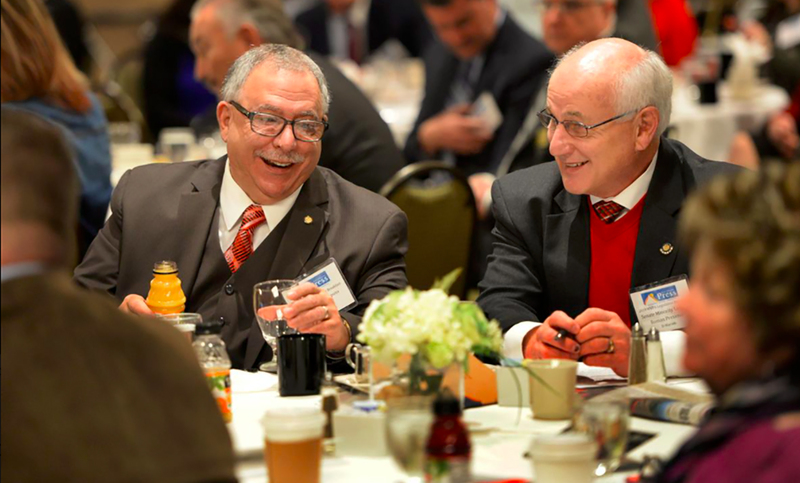 Two Marion County Democratic legislators, House of Delegates Minority Whip Mike Caputo, left, and Senate Minority Leader Roman Prezioso, share a laugh at Thursday’s annual West Virginia Press Association legislative breakfast. CHARLESTON, W.Va. — At the midway point of the 2019 legislative session, legislative leaders offered divergent views Thursday on where the session stands, particularly on the Senate’s omnibus education bill. Senate President Mitch Carmichael, R-Jackson, said the idea that Senate leadership is pushing radical, anti-public schools measures in the bill (Senate Bill 451) is unfounded.